Sock pair number ten is done - and they are absurd! 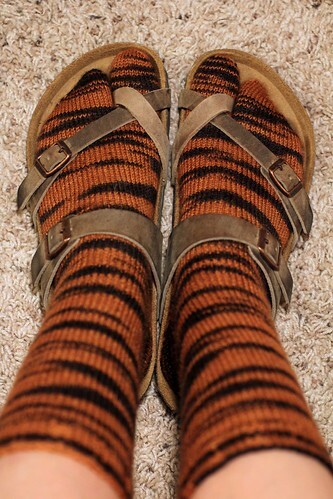 Yes, they were made to go with sandals. Because I'm cool like that. The whole celiac thing has caused horrible swelling and pain in my feet and hands. (I'm still dealing with it some, actually. Apparently my body is giving me a celiac-immune reaction to rice, too. Walking is not always my friend.) Anyway, when that happens, my sandals are the only thing that can give any relief (for my feet; they do nothing for my hands). Last month the weather turned cold again and I had to choose between cold feet or an inability to walk. I usually ended up with cold feet. But now, I can walk and have warm feet! Well, once it gets cold again. I haven't worn any socks in about two weeks. Next up: obnoxiously neon stripes!